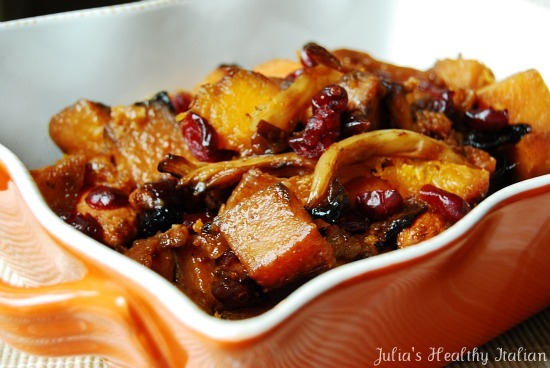 This combination of Butternut Squash, Anise and Cranberries﻿ is an Italian Autumn must. I combined the traditional American veggie with a traditional Italian veggie and the outcome is delish. Its got a sweet pop of cranberry, squash roasted to creamy perfection and the tender crunch of the anise. Is it called anise or is it called fennel?...I call it finoccio. Theres lots of words that have become part of the Italian American vocabulary. Among my Italian friends, its well understood. A scula pasta is a scula pasta, not a colander. A cupino is a cupino, not a laddle. My mother takes the cake though. She has Italian words made English that could make you fall off you chair in laughter. Some of my favorites are ridicala.....thats ridiculous. Then theres esso nuts, otherwise known as hazelnuts, but sound much worse than the way I chose to spell it! I will probably catch a beating for this post, so I hope you enjoy it. I hope its worth the size 10 shoe thats gonna get me later on this week! 1/8 cup olive oil, or 3 tablespoons. This looks wonderful, I never know what to do with fennel! Your mom is too funny with those nuts, sounds vulgar! Hi Julia - I dont see the recipe posted tx! Julia - looks great! Please post the recipe - would love to give this a try! Thanks. This post made me laugh out loud! Thanks for that! Looks delicious! Hey Tricia, you laugh because it's true! I would never have thought of pairing these flavors but it looks and sounds delicious. Thanks!